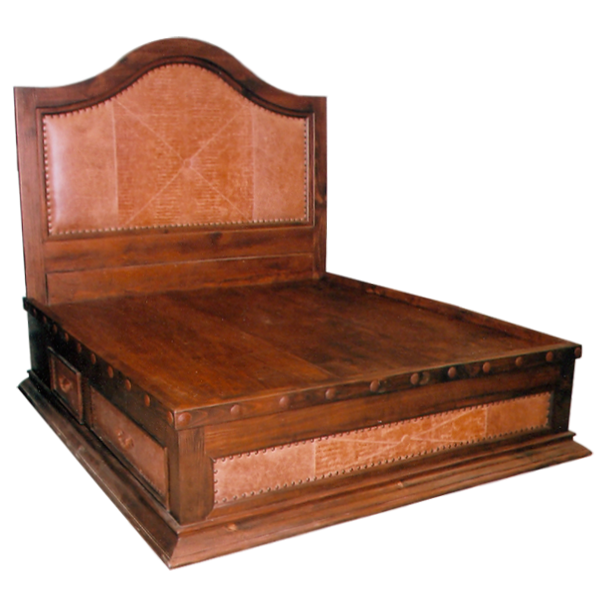 The entire structure of this gorgeous, handcrafted, Spanish colonial style bed is built with the finest, sustainable, Pinero wood. The inner, solid wood, curved headboard is covered with natural colored, patterned, full grain leather, and the leather is double stitched together for extra strength and durability. The bed has a solid wood, structural base, with two drawers on each side of the base. Each drawer has a hand forged, iron handle in its center. The end of the base is covered with matching, patterned full grain leather, and all of the leather is precision hand tacked to the headboard and to the base with gilt nails. Hand forged, iron conchos are intermittently hand tacked to each upper side of the base. The bed rest on a staggered, solid wood molding, support base, and the bed has a classic finish. It is 100% customizable.